Retro Girls Banner Background Pack - Free Photoshop Brushes at Brusheezy! 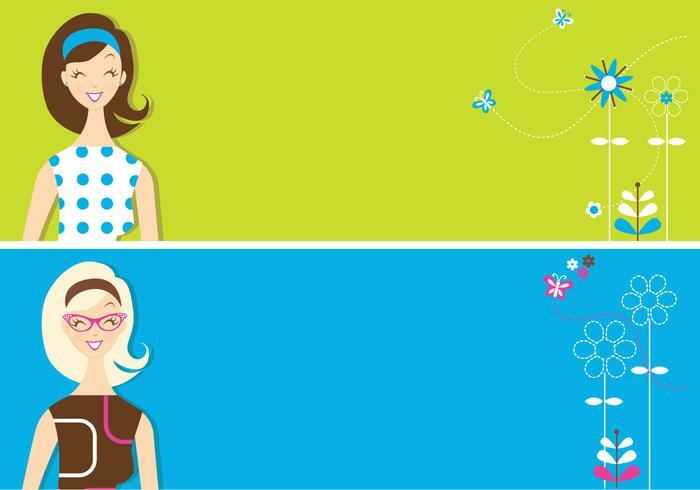 Throw your work back to the 60s with these new Retro Girls Banner Background Pack! Included in this pack are two bright colored retro girls banner backgrounds decorated with bold flowers and butterflies. You'll love the way these retro girls are dressed - they have the cutest cat eye glasses! Rather have the fully editable vector pack? Download the <a href="http://www.vecteezy.com/people/57728-retro-girls-banner-vector-pack/premium">Retro Girls Banner Vectors</a> over on Vecteezy!